Thanksgiving is right around the corner. That three day work week is in my sights, as are the Black Friday sales! I like to start planning my Thanksgiving menu about a week in advance unless we’re squatting at someone else’s house. This year it looks like we’ll be hosting at our place in Seattle. I personally like a Thanksgiving meal that’s a balance between old favorites (buttered rolls, pumpkin pie, etc.) and newer/healthier favorites (roasted butternut squash, kale salad, etc.). 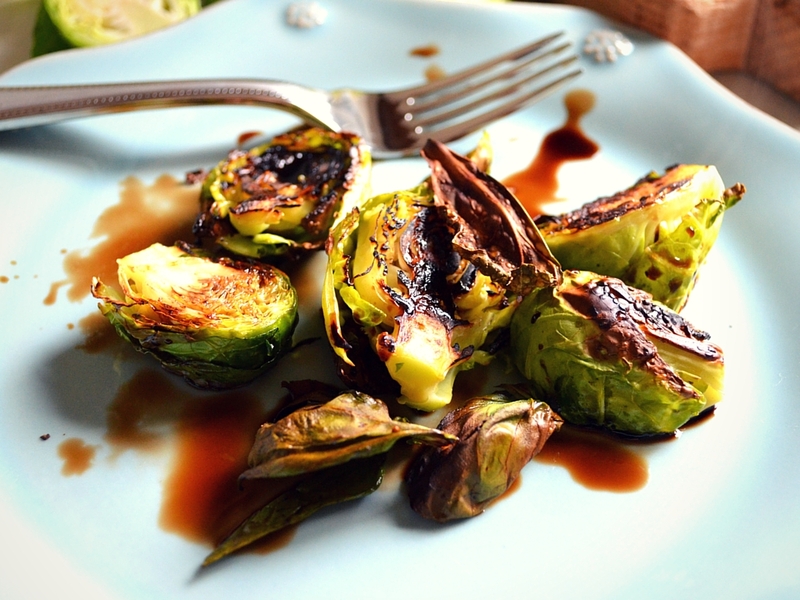 This year I’m breaking out a simple recipe for brussels sprouts featuring one of my all-time favorite condiments: balsamic vinegar reduction. Balsamic vinegar reduction is simply balsamic vinegar that has been cooked down on the stove to create a sweeter and richer flavor. The liquid becomes thicker, almost like a syrup but no sugar is added. 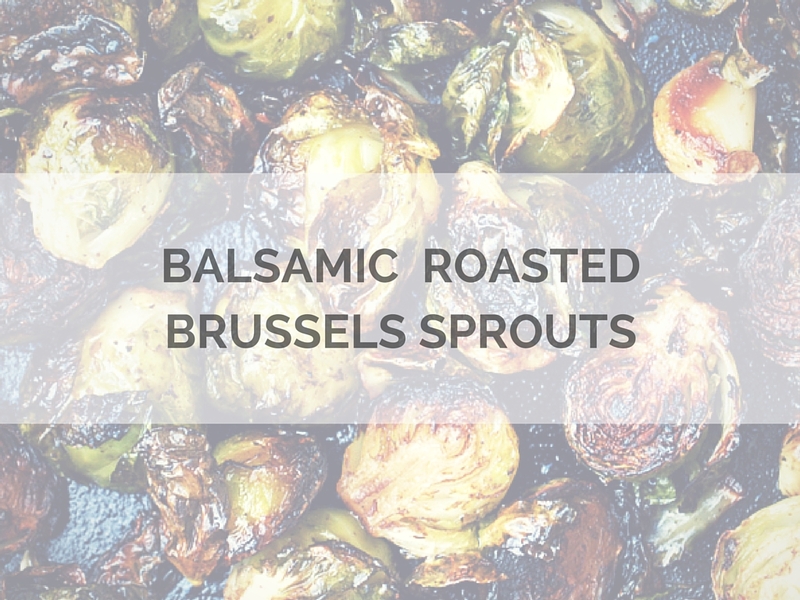 It’s delicious stuff, good on top of almost any recipe, but is especially good when drizzled on top of roasted vegetables. 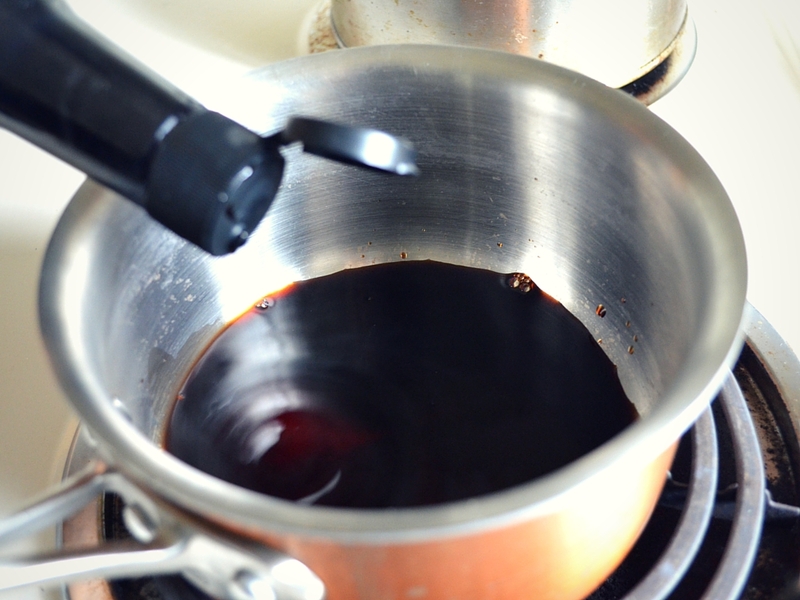 3 tablespoons balsamic vinegar . Heat oven to 400 degrees. 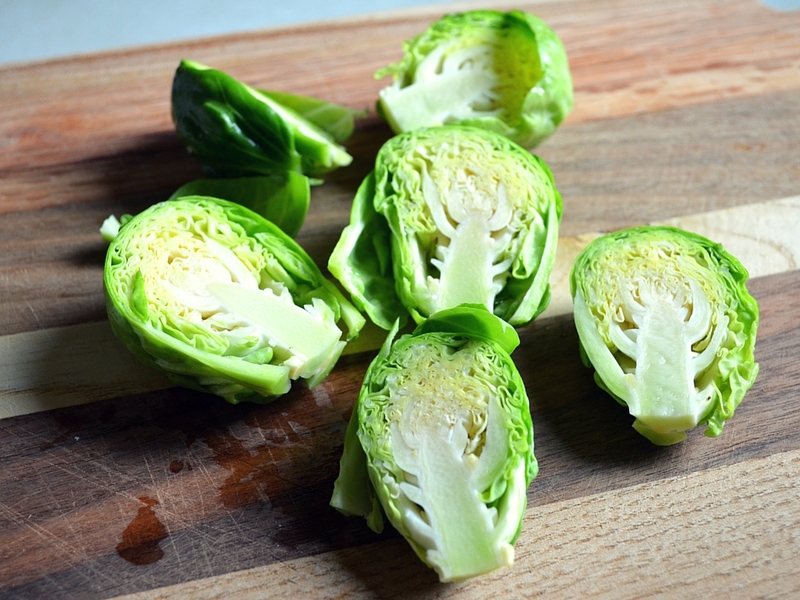 Trim off the bottom of your brussels sprouts, and slice in half from top to bottom. Heat your oil or ghee in a cast-iron pan over medium-high heat until it shimmers. Place your sprouts in the pan cut side down. Only do a single layer so every piece gets nice and brown. Nestle your garlic cloves in the pan and sprinkle everything with salt and pepper. Let the sprouts cook they begin to brown on bottom – make sure not to stir them until this happens. While they cook, pour at least 3 tablespoons of balsamic vinegar into a small saucepan. Heat the vinegar over medium-high heat until it reduces by half and develops a syrupy texture. Be sure to stir frequently to prevent it from burning. Remove the reduction from the stove and let it cool for a few minutes. 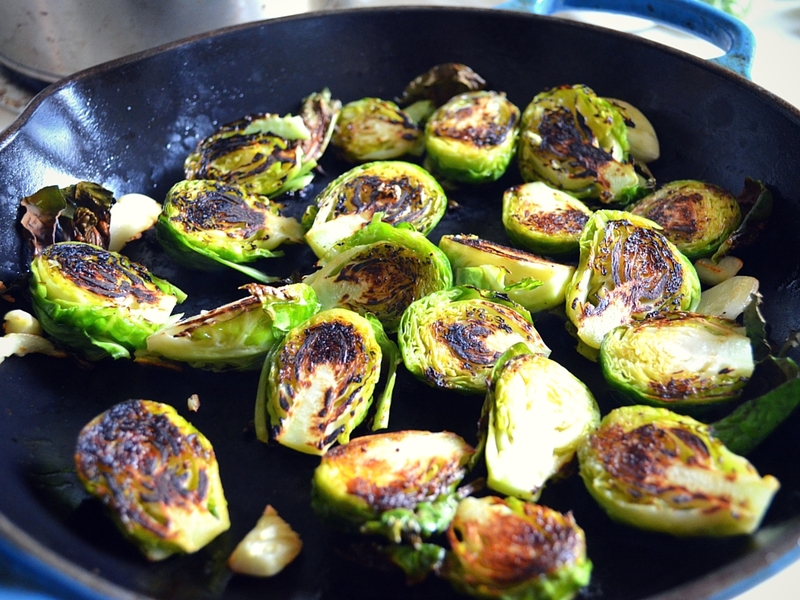 Once your sprouts have browned, shake the pan to stir and transfer to the oven for about 10-20 minutes. Stir or shake the pan a few times to make sure the sprouts evenly cook. Remove when tender. Taste and add more salt and pepper if needed. Drizzle with balsamic vinegar reduction and immediately serve. This recipe serves two, so adjust your ingredients accordingly if you’ll be serving this for a big crew at Thanksgiving. Love the color of fresh brussels sprouts. Sprouts can vary by size, so keep this in mind. If yours seem extra large, feel free to cut them in fourths. Conversely, if your sprouts seems extra small, feel free to roast them whole. Getting ready to reduce my balsamic vinegar into syrupy perfection. The final and delicious product. Note, this dish is best served right out of the oven. I kept some leftovers in the fridge and they got a little soggy from the balsamic liquid. Have you started planning your Thanksgiving menu this year? Another favorite Thanksgiving recipe is this kale salad. You got to have some greens on the table to balance out all those carbs, right? Happy eating! 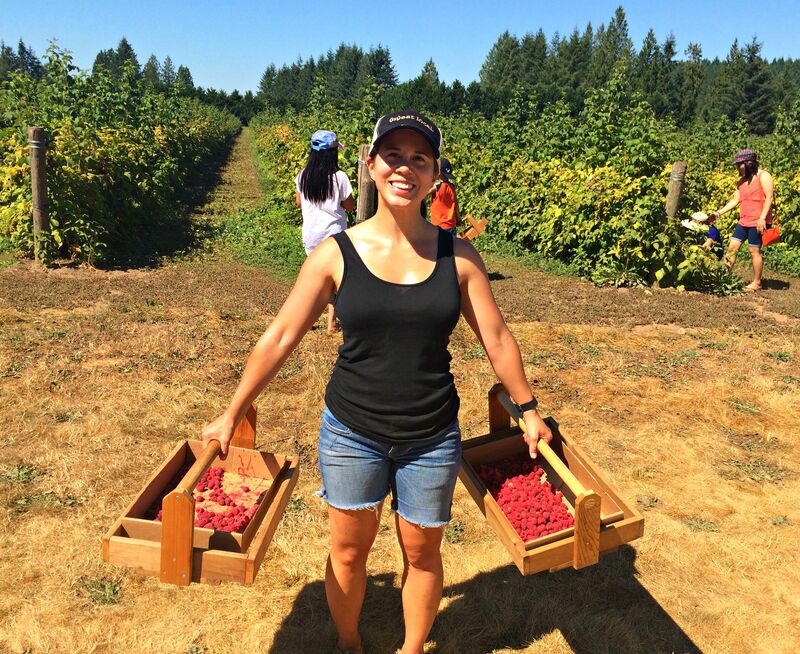 This past weekend, Nick and I went raspberry picking with some friends of ours at Remlinger Farms. Growing up, we went berry picking every year, making jam and pies from the (literal) fruits of our labor. It may sound crazy, but as soon as I stepped back into the fields, I felt this wave of nostalgia just wash over me. Oh to be ten again, eating berries until my stomach ached. We left the field with four pounds of deliciousness. Look at that happy face. 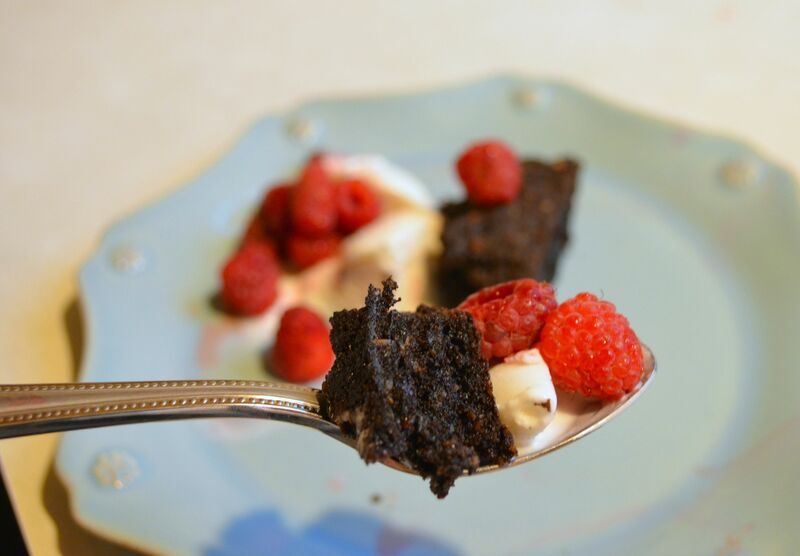 Fresh raspberries pair perfectly with chocolate, so our trip had me craving a chocolate brownie something bad. I’ve been trying to keep the Paleo thing going as much as possible, so my goal was to come up with a brownie recipe with satisfied my cravings while still keeping things relatively healthy. I’ve tried making Paleo brownies with coconut flour several times, and they always come out too cakey. For me, it’s not a true brownie unless it’s rich and fudgey. After spending way too much time researching the blogs, I found a promising recipe from Elena’s Pantry using almond butter as the core ingredient. I did a little tweaking (I can’t help myself) and ended up with hands down the best Paleo brownie I’ve ever had. Seriously, it’s good. The best part is that this brownie recipe checks off all the health food buzz words. 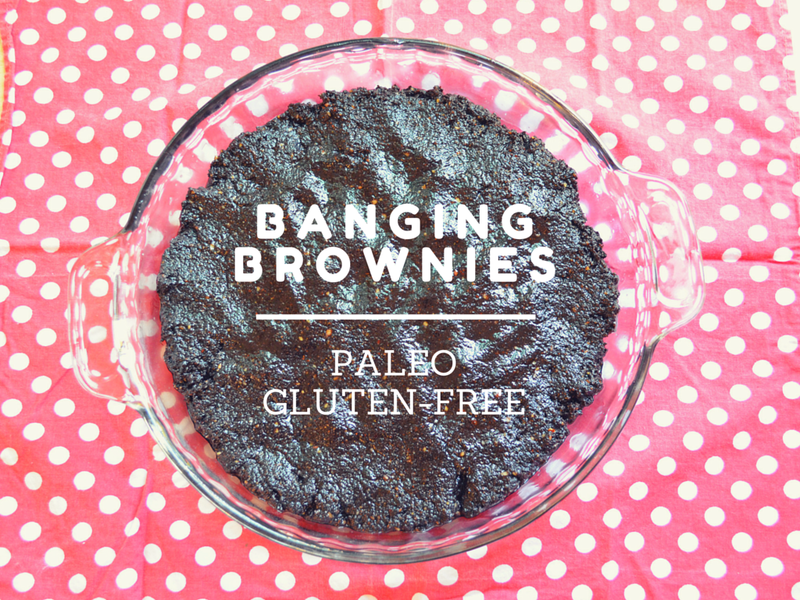 It’s paleo, gluten-free, dairy-free, and refined sugar-free. Getting your chocolate fix and feeling good about it? If that doesn’t make these brownies banging, I don’t know what else would! In a large bowl, blend together almond butter, eggs, honey, jam, and vanilla until smooth. I think you could actually use any type of jam in this recipe as long as it was pretty smooth. You really can’t taste the flavor. Place the baking chocolate in a small bowl and submerge in almond milk. Melt in the microwave, stirring every 5-10 seconds until fully melted. The milk and chocolate should combine into a smooth paste. Scoop the paste into your large bowl and blend until smooth. 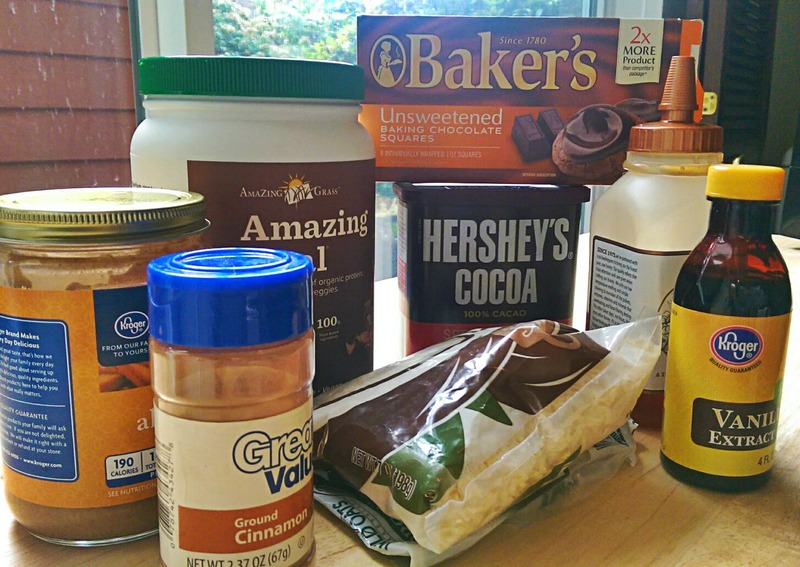 Blend in cacao, salt and baking soda. Grease a 10 x 10 baking dish, or a pie pan. I like to use coconut oil, but anything will do. Pour batter into dish and bake at 325° for 25-35 minutes. Let cool before serving. Note: this recipe is meant to have a deep chocolate flavor without an overwhelming level of sugar. Adjust the sweetener according to your preferences. I recommend serving a slice loaded with fresh raspberries and vanilla ice cream. I have one more slice left to enjoy tonight and then we’ll see how long I can hold out before making another batch. Any bets on how long I’ll make it? 1 day? 1 week? 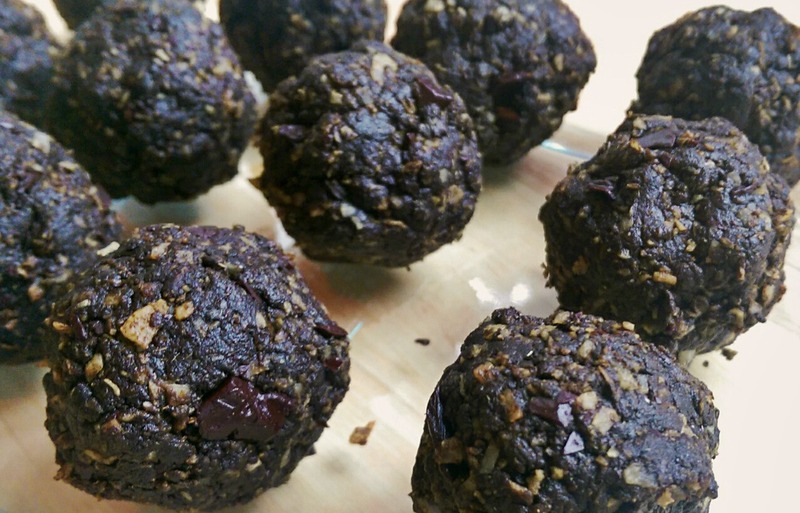 Here is my recipe for a delicious, easy, and healthy snack on the go. Little balls of energy that are, well, pretty amazing! Gather up your goodies. This recipe is super quick and easy if you have all of your ingredients ready to go. On a side note, please ignore my dirty kitchen window. I will get around to cleaning it one of these days. Combine the first three ingredients in a food processor and pulse to combine. Add everything else in except the chocolate and pulse again. The mixer should start clumping together. Adjust your wet and dry ingredients if needed until you reach the texture shown above. 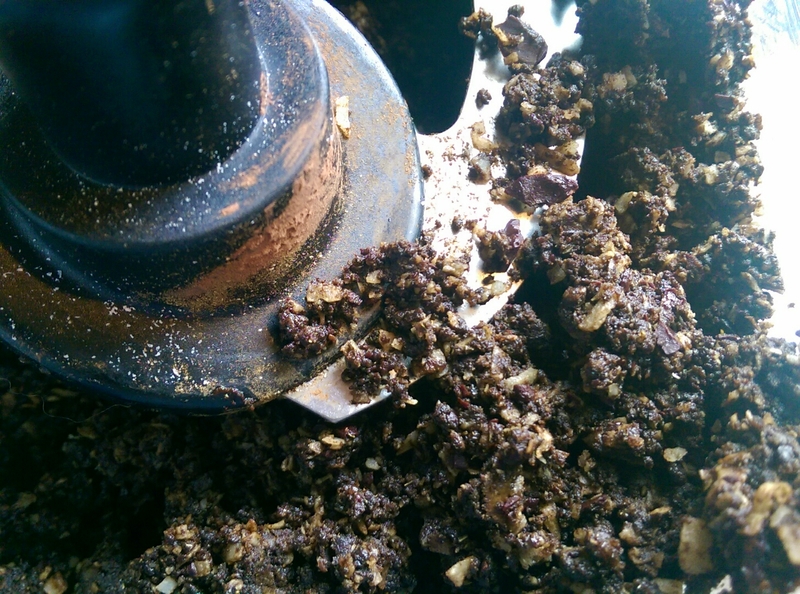 Then add in the ounce of chocolate, breaking it up a couple of times before throwing it into the food processor. Pulse a few more times until the chocolate is chopped up and well distributed. Taste the “dough” and add any additional sweetener if needed. 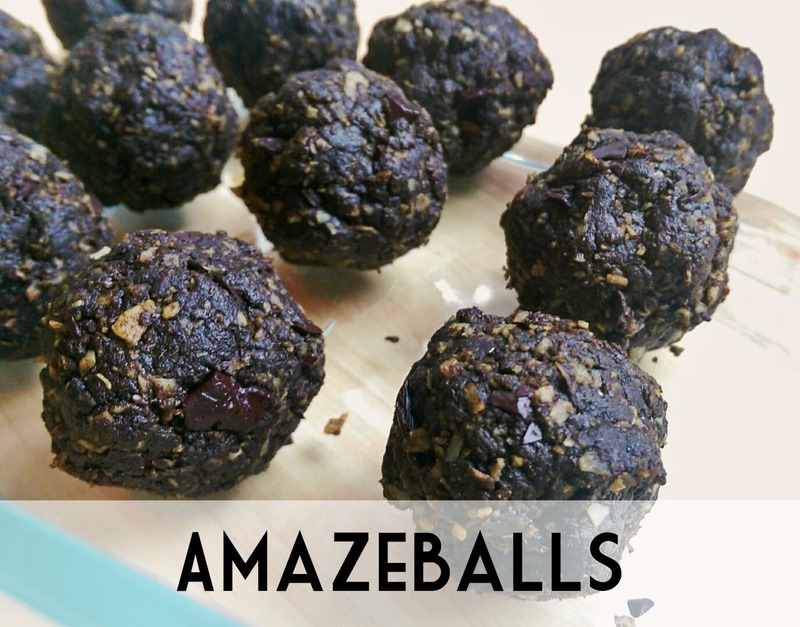 Once you are satisfied, use your hands to roll the mixture into amazing balls of deliciousness. I like mine to be big enough to really satisfy me, so my balls are about the size of a standard meatball. Store in a sealed container in the fridge. They won’t last long! These would be great to keep at work or to toss into your lunch. I’ve only made the chocolate flavor, as I never get sick out it, but it’d be fun to try a few different variations. PB&J maybe?